I just wanted to highlight this book, having mentioned it a couple of times over the last months. I love this book, it's an awesome and dense read. The premise is, an English girl goes to live in Tuscany and for a year, observes and details exactly the life of a Tuscan housewife in her kitchen. She notes all the farm recipes calling for olive oil measured in wine glasses, specific kinds of tomatoes and wild peasants (as well as more common meats like beef, veal and chicken). Romer recounts the way of life folks in Tuscany have enjoyed for centuries, tabling the changing of the seasons and the household chores according to the seasons- in winter they spin wool and cure quantities of prosciutto, in springtime the pecorino cheese is made, while in summer the farm is ripe with corn, pears, and sweet peas and in autumn, they wine and harvest. The rhythm of life naturally follows from the foods of the seasons. The whole process is evocative and informational. If you're a fan of Italian cooking, this brings you back to the basics, the blends for pasta and pasta sauces, the combination of specific vegetables for the 'odori', which she explains is the substance and fibre base to any pasta topping. The recipes are incredibly authentic, any Italian cooking class you attend will pretty much have the same recipes that grew out of this region and I myself have used many of the recipes listed in the book. 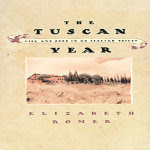 This is obviously not the only, nor neccesarily the best book on Tuscany out there but I think it's a classic introduction to the cooking and culture of Tuscany and that it's so important not just to cook food or take pictures of it, but really read about it and understand both the context and culture of what we are celebrating. Thanks Auntie C. for a great gift! You guys all know that I'm kind of a food traffiker. I wanted to share what I brought back and what I did with the produce from a recent trip to Paris. The first things I bought were Marmande tomatoes. After reading about it in Elizabeth Romer's book, I just had to get them when I saw them, staring at me out of their little folds, in the Avenue Wilson farmers market. The lady was so sweet, she threw in some Italian tomatoes which I baked alongside the Marmande. My idea was to bake them whole, so that they would preserve their shape and yet be a sitting capsule of warm juice. Grain fed, refers to the fact that the cow was in a feedlot before being slaughtered. Why is this important? It's because that's when the cow (or calf, depending what you're buying) fattens up and the fat has an opportunity to marble. Wagyu is all about the marbling of the fat, generally speaking, they are at least 120 day grain fed but Wagyu cows are actually an entirely specific brand or type of cow and the marble score of the fat has to be, on a scale of 1-12, at least 6 and prefably higher than 9 to qualify as Wagyu. So, we had the idea for the tomatoes and steak. Then, I was thinking about this dish I had eaten at Joel Robouchon where he had paired a slimy warm foie gras with whole baked alcoholic cherries. We had bought some tins of foie gras and duck rillete at the Avenue Wilson farmers market from the lovely old man at the Lafite stall, so for the starter, I wanted to make a fig dressing simple green salad with pine nuts, then serve it with foie gras on crostini and warm cherries. It helped that while in Le Grand Epicurie, I came across a beautiful stack of dark blood red cherries and (thanks Chris!) got some to take home- this is a picture of the de-pitted cherries. I also had girolle mushrooms, so I thought maybe I'd get creative with the side and make a mushroom risotto. The dessert would be thankfully, made by Colin, who's home for the holidays. I needed to get my panna cotta fix and I just don't have his good hand with gelatine. So, at about 10am that Saturday morning (this for all those people who say, gosh, doesn't it take forever to prepare a big meal..well, yes and no), I wandered off to pick up some groceries, specifically the beef, a baguette, some vegetables and this massive forest of herbs. The basil was going off a little so I got a huge garden of it free, I wanted to make this beef rub, that called for ground garlic, anchovies, sea salt, basil and parsley. When massaged onto your meat and grilled, it forms a salt crust, that's supposed to be absolutely delicious and smoky. However, that plan fell through, as Colin looked dismissively on the idea and suggeted the more normal rosemary and thyme oven bake (because we didn't want to start a grill, so he felt the anchovy flavour would be baked Into his steak, which was to him, a travesty on good meat...I'll have to wait till somebody else offers a grill to try the former recipe and in the meantime, I made pesto sauce out of the basil and froze that). After that bout of grocerying, there was nothing really to do. So I sat on my porch (11am) and thought about de-seeding some cherries. You want to bake them whole and with their stalks, for dramatic effect...but you don't want seeds. Neither do you want a big gaping scar. The solution? Tweezers. Slice a small slit in the base of your cherry, like so. Angle the tweezers in, flip them around and quickly grip and pull out the pit. If you wait too long or fuss too much about, the cherry juice will start to leak out of your surgical hole and drip all over your fingers. It's worth slicing up some cherries to take a look at the anatomy of the seed, it's convex on the top and bottome surface, ergo, it works best if you grip and extract with the tweezers from the right and left side. It's really common sense. 11.30am Messing about with the cherries over. Soak them in rum or port. I used my favourite, De Botoli's 8 year Tawny Port from Yarra Valley in Melbourne. This is the most smooth, toffee tasting stuff ever, perfect for Sticky Date Pudding Sauce. Oh yes and I had decided there needed also to be quick expresso cup of soup in between the starter and main, so I steamed the artichokes I'd bought and blended them into a soup, added some cheese and sliced up the remainder of the artichokes for garnish. While waiting for the artichokes to steam, I pitted the cherries, rinsed the salad vegetables and set the table. We were all done between 10am and by lunchtime at noon. It should be written into the recipe for dinner parties "Then set and Rest for 7.5 hours". If your dinner party starts at 8pm as this one did, then at 7.30pm, you want to toss the salad in some fig dressing, pour in the pine nuts, shove the cherries, mushrooms, tomatoes and the sliced bread in the oven. This is the secret of cooking for numbers, if you bake, you bake everything at one go. If you steam, you steam the artichokes, whatever side vegetables you serve, the puddings, the desserts, all at one go too. The other secret is dovetailing. What the heck is dovetailing. Well, it's the secret to all cooking organization. By which I mean, actually cooking a meal in courses, not like a one-dish thing like risotto which is one pot and stir and stir and stir. You get my point. The definition is dovetailing is a technique in algorithm design, which refers to interleaving different computations, performing them, in a sense, simultaneously. Stay with me, I'll explain. The cheem (complex) way to think about it is a breadth-first, rather than depth-first manner. But forget about that. The common sense way to think about it, is that people assume that a dinner party, that four courses, have to be cooked in a step by step, consecutive order. This is entirely untrue. Dovetailing means that you break down the steps involved in each dish and work out a new order, where the different steps are interwoven such that they can be all be done either at the same time, or in between each other, so that you save time, effort and frustration. Everything in cooking, can be boiled down to (well, ingredients obviously but in the actual process of cooking..) timing. If you can master that, in the way that you structure and efficate your preparation, then you control the dinner, it takes as long to cook as you allow it to and not the other way around. One rule is what I already explained- you perform steps in batches. Does it matter that the tomatoes, bread, mushrooms and cherries go into different courses? No. It does not. What matters is that they are all using the same implement (the oven), the same heat and cooking at the same time. You can even re-heat your soup together with all this stuff, in the same oven. The second rule is probably that you don't ever cook dishes that require the same implement. If you have three dishes, one should be a chilled dish that utilises the fridge, another the stove and another a slow-cook in the oven. Never, never, pick four dishes that all have to be cooked on a stove. You know why? Firstly, most stoves don't have four cooker hobs. Secondly, you will stress out all the people at the stove because there are four seperate things on the boil. Thirdly, you will never serve the courses on time, causing your dinner to run at least an hour behind schedule before it's even cooked. Probably the third rule should be something like create workspaces in your kitchen. One for the starter (prefably away from the stove, since most starters aren't cooked). Another for the main, which is near the oven and the stove. A seperate plating section for dessert. Arrange all the ingredients, garnishes and plates that you need, for the right number of dinner attendees, spread out in the same space and ready to carry to the table to be eaten. This cuts away at least 20 minutes of wasted ding-donging time when cooking and plating (and trying to find stuff that you never laid out). In supply-chain terminology, this is Lean. Let's go back. At 7.30pm you have all these things in the oven. Then at 7.45pm, you take out and cool the bread and mushrooms, put the soup and soup glasses into the oven, then assemble the risotto, boiling, on the stove. Cool your heels in the living room, waiting for guests to arrive. If you're gross enough not to have showered before this, please, go shower. If not, play some music, pour the wine, drink the wine. 8pm, guests arrive. You go into the kitchen, plate the salad, spread the foie gras on the crostini and pull the cherries, hot from the oven, onto the plates. Turn down the heat, put the steak into the oven. Serve first course. When guests are almost done eating, go back into the kitchen. Stir the risotto and add cheese, butter and basil bunches. Colin looked into the pot and said "How brilliant! You mean this thing can go start-and-stop in its cooking?" Pull the soup and soup glasses out of the oven (the oven is still baking the tomatoes and steak at this point, by the way, in case you haven't been keeping track) and pour into hot little glasses. 8.20pm, serve the soup, second course. 8.25pm Close to done with soup? Your steak has now been in the oven slightly under half an hour at low heat. Pull it out to cool. Stir the mushrooms, now just warm, into the risotto, plate risotto and pull out tomatoes from oven, plate those. Plate steak. Serve steak. This should take the eating from 8.30pm (serving steak) to 9pm (steak eaten). Re-fill wine glasses, switch from red to dessert wine. We served a 1997 Chateau Louis Poyferre and a 1999 Hungarian Tokaji. The last part is easy, it's the dessert. If you chose an involved dessert, say, souffle or sticky toffee pudding, it would just now be emerging puffed and triumphant (hopefully) from the oven. If not, you could also have gone with a citrus light say, lemon cake, already taken from the oven and now sitting in the kitchen, releasing its steamy juices. If not, then you'd be like Colin, unmoulding his panna cottas out of the fridge, dancing some raspberry puree and blueberries across the plates. Bon Appetit! Thank you, Y. for introducing me to the notion. Don't you guys think this is a pretty cherry poppin' cupcake? Cherries are now in season, yeah, summer! This one is, despite the dark hue, a Rainer cherry, otherwise known as a white cherry (the flesh is white). If you want a lemon cupcake base, please follow the recipes listed here and the two recipes in my previous post about lemon cupcakes (in June archives). I've discovered that despite their slight differences, I prefer Recipe 2. In the coming days, I will post on a savoury use of cherries but below I have the super-easy-peasy recipe for chocolate rum and cherry cupcakes. I think I've got prep time down to 10 minutes or less, which leaves a good amount of time to mess about with cherries and alcohol. The merenge buttercream is flavoured with green tea, which I thought provided a nice, light counterpoint to the chocolate flavour. If you wanted something stronger, you could make a dark cherry and rum swirl icing. Enjoy! 1. Cube handful of cherries. Macerate (soak) cherries in a small pool of rum. 2. Mix the dry ingredients together. Make a depression in the flour, whisk together the egg, oil, vanilla essence and milk and mix in. 3. Mix in the boiling hot water. Stir till smooth. 4. Spoon the mixture into stiff paper baking cups till 2/3 full, adding the cherries in the middle of the cupcake. If you want, you can actually bake the chocolate cupcakes whole, then slice in half and ice them with chocolate ganache and rum cherries. 5. If there's not much rum left from the cherries, you can throw the remaining into the batter mix. 6. Bake for 20 min at 170 degrees C. Wait for cupcakes to cool or stick 'em in the freezer for a little bit. 7. Mix up a batch of buttercream. 8. Mix in green tea powder and a sliver of green colouring into the cream, pipe in fat swirls, decorate with dragees and cherries. Emerge with pleasingly handsome cupcakes. Earlier in June, it was reported that barely two months after being named number 83 on the Restaurant Magazine's World's Top 100 Restaurants, Les Amis has lost its chef, Gunther Hubrechsen, who has decided to venture out on his own with a new fine-dining French restaurant that will bear his name. Mr Hubrechsen was named Rising Chef of the Year 2006 at the World Gourmet Summit Awards of Excellence. The new restaurant is a 50:50 joint venture with the Garibaldi group, which comprises Garibaldi, Menotti, two Ricciotti outlets and Brotzeit, a German restaurant in VivoCity. The restaurant is located right beside Garibaldi on Seah Street but is run independently. From the first unofficial reviews that I've heard, the food is great and the prices...the prices are what everyone has been talking about. While I haven't actually heard the word "value" spoken out loud yet, I've had some discerning palates give it a two-thumbs up on all angles. Go try it and let me know! Whoop! My favourite place to bring French people who've never eaten Japanese food. This place is the MacDonalds of Singapore's Japanese restaurants- quick turnover, cheery if slightly abrupt service and consistent food quality. Mervyn, one of the brothers who runs this chain of restaurants, will tell you, as he repeats to me, Every Single Time I've Been, that all this means that the fish is fresh and yes, it generally is. More importantly, the dishes are consistent, the service is generally fairly prompt and the prices are moderate. The flagship is at the basement of Tanglin Shopping Center while the branches are in Paragon, City Link Mall and Vivo City. Should you wish to go to the flagship on a Friday or a weekend, you should definitely call ahead to book. This is the line headed out the door when I arrived. The best place to sit, especially with a visitor, is at the bar. Mervyn can make you a bunch of specials and your visitor can watch the chefs at work. Today, I wasn't particularly hungry so I ordered some rolls and sashimi. This is the inside-out tempura roll and the salmon skin handroll. The sets are not bad, if a little generic (yes, they come with that slice of watermelon), this is the sashimi and cold zaru soba set. The green tea noodles are really refreshing and come with a cute trio of chives, wasabi and a quail's egg to crack into the dipping sauce. If I could make one complaint about Akashi and it's not that strong a complaint that I would never go back...it's that the prices are more than a little steeper than what they were. It used to be quite a joy to come here, especially for lunch, where they had cheaper prices but this time, the bill was almost what we would have paid at Yoshida (which has an incomparable atmosphere). Also, this place used to be the casual but nice-dinner haunt of Hokkien-speaking locals with mustaches, drinking beer, in blue worker shirts with pens sticking out the pockets. Now, half the restaurant were poshy expats, with their thick European accents and their unfriendly, elderly parents in tow. Isn't anything sacrosanct anymore? E. and I wanted to find a restaurant for a dear friend's birthday lunch and we stumbled upon (well, led really, by Chubby Hubby's enthusiastic post) The Universal at the Duxton Hill Conservation Area. This was new, sounded like a good experience, was suitably upmarket and was pretty near to our office. Though I did grumble the way there about the scorching Singapore heat. The decor at the Universal reminds me of Auguste in Paris, which is helmed by Michelin-starred Gael Orieux and boasts a similar contemporary design and paintings. The opening picture is The Universal and this picture is from Auguste. The only difference is that the paintings in Auguste are of the Bamiyan Buddhas, whereas in The Universal, they are the work of a talented local artist and are actually for sale. The restaurant really is lovely, it's a beautiful, hidden, shady part of Singapore and the renovation of the shophouse has transformed it into a sun-drenched, cosy space. The wine bar is on the ground floor and there are more than 500 labels from 1937 onward. The narrow flight of stairs leads upward to an intimate dining area on the second floor, which accomodates about 35 people. We ate on the mezzanine level which is a good place to have a smaller party of about 4 tables. We had the 3-course lunch sets which I believe were priced at about $34. The chef sent out an unusual amuse bouche, it was like a tropical chicken macnugget, with a thai chilli sauce in the little egg cup that held it. For starters, the others had the Pan Fried Foie Gras served with port wine jelly, dried fruit compote and brioche and I had the Jerusalem artichoke soup with grilled scallops. I was surprised, the interior of the restaurant was just that little bit pretentious and we were the Only Table on the mezzanine level, leaving the staff to fuss over us like mother hens. I must admit that despite their good and most importantly, Warm tomato bread, I was secretly wondering what the food quality, especially of the work lunch, would be like. The soup was delicious, full of artichoke taste and with thick bits of artichoke still submerged in the soup. I usually don't order scallops in Singapore, finding them to be skinny, charred affairs, but these were actually juicy and not fishy at all. The soup was well-presented with a real interesting mix of colours and it was still piping hot. I was impressed, both by the soup and the foie gras and at this point, started feeling cheerier about the meal and the walk in the sun to get there. There wasn't much variety in our main course orders either, although having looked through the menu, I'm definitely coming back to try the pasta dishes, especially their gnocchi. C. had the Beef Tenderloin wrapped with Procuitto Ham and topped with Oyster Fritters and Asparagus accompanied with Béarnaise Sauce and E. and I had the Cannelloni Beef Gratin with Fontina Cheese on Tomato Sauce. What is that? That would be a rolled lasagna. When it came, I was even more impressed. The main plates looked like works of art! Gorgeous colours! And it wasn't just the colours, either, the beef tenderloin was excellent, still tender and juicy on the inside, while the tempura-ed asparagus was bursting with flavour. (If you look up the Singapore Street Directory, you'll see that they wrote, "the beef tenderloin is done to perfection, retaining the efferverscence in the inside" which is just putrid and impossible- hello, efferverscence? In Steak? Ah, I digress. I was on the subject of how their mains looked like works of art. That was the prettiest rolled-up lasagna that I've ever eaten. It didn't taste half bad either. It was a cheap main for a set because the meat is just ground chuck but I still had a good time. The desserts were the Chocolate Souffle with Vanilla Ice Cream (it was telling that they didn't bother to describe it as French Vanilla Pod Ice Cream, which it was clearly not)and the Coffee Creme Brulee with Raspberry Tarte. Both were not bad, if nothing really special. I think if I had to point to one weak point in the set menu, it would be the dessert. The lack of creativity was a pity because the appetizers started the meal so strong. The Chocolate Souffle was a little dry and crusty, although it had risen in it's expresso cup. The coffee creme brulee wasn't bad but it was a little too solid for a creme brulee and the raspberry tarte was a bit of a sad affair, sort of marooned fruit-on-a-biscuit beside the souffle cup. I would definitely go again, in fact, I fully intend to and you need to go too, to support this great restaurant and talented chef. It didn't look that busy when I was there so maybe they need to revitalize their lunch set price (hint) but I'm sure on any weekend, the place should be jumping with its hip, intelligent persona. Well, it's that time of the year again, when food bloggers around the island get together and eat rather too much food. This year, June is organising, so head over and book yourself a spot! It's summer, so there really are a lot of visiting friends. I got a chance to check out Macaron, the new hip dessert restaurant, with some colleagues and a surprise college-friend guest. Thank you, JS, for the lovely dinner and the chance to meet up! On first sight, Macaron looks like your typical sleek, black cat of a restaurant. The location is intuitive, right next door to Chef Pang's Canele, his show-stopping confectionary in Robertson Walk. The lettering of the restaurant name, back-lit and cut out of a metallic copper plate, is minimalist and subtle and the sparse decor of the place was darkly pretty. Unfortunately, that effect was a little marred by the exposed ceiling (you know, those plumbing sucking vent pipes) and the neither-here-nor-there cement floor. The lighting also made photography very challenging. There is also something wrong with the prix fixe menu. It gives you a choice of 4,6,9 and 15 courses. The problem is that the 4 course meal, does not have a main course. You basically get to choose an appetizer + three desserts. I don't know if they realize how cloying and dessert-heavy a combination that is, plus of course, this means that if you go there for dinner, it's a con to get you to upgrade to a 6 course set and you have no choice But to eat a big meal. There is an ala-carte menu but there's no ala-carte ordering. What I mean is that there are prices for each item but these can only be added on to one of the prix-fixe menu, ie. you can't put together an ala carte choice of a meal. Considering that there is no common theme in their desserts and the flow from one dish to the next is not seamless, I don't see the point in disallowing people to put together a 3 course meal or whatever combination of dishes they see as managable and desirable to them. When I asked the Les Amis group about it, they said it had been Chef Pang's choice to direct people's experiences and not to disturb the creative flow of his ideas. While I buy that, I also think that a dessert restaurant is already such a niche idea- is it really necessary to make it so inflexible and unaccomadating as well? The whole idea is to draw people in and introduce them to this type of dining. I could well imagine less exposed diners being peeved at the the maitre'd's rude, aggressive and somewhat gleeful "there's no ala carte". Also, it doesn't welcome all those essential customers who wanted a small meal or an in-between meal snack. The appetizers were good. I had a King Salmon Tartare with Pineapple, which sounds like an odd combination, but it was excellent. We also had the Pulpo - an interesting creation of sautéed potato with octopus and paprika air (foam). The one let down was the olive oil cake, where we were actually expecting something resembling a traditional olive oil cake and got a salad with some olive oil-ed croutons. Not that impressive. The mains are a bit hit and miss. I've heard that the pork belly confit (served with a side of apple mashed potato) is delicious and the pork belly is crusty and onion-y. The main that most of us tried though, the mentaiko pasta (and the real reason we were there, having read Chubby Hubby's post which piqued our interest), while not bad, was awful heavy, it was like some beginners carbonera with ikura. There really was ikura too, sprinkled into the oily cream-based pasta sauce and on the fat noodles. Before the meal, one of my hungry colleagues asked the server if it was a small portion, in which case, he was intending to and did, order two servings for himself. I thought it was a bit cheap that the server immediately said, in a brush-off manner, yeah, very small. Really, when the dish came, it wasn't that little and he could have mentioned that it was extremely creamy and heavy, rather than just pushing him to double his order, which he eventually couldn't eat anyway. This is the "sunny side up" that my colleague ordered, a coconut egg white and passionfruit egg yolk, with olive oil and cocoa masquerading as pepper. I had to check the menu to see what I had, it was apparently a banana flambe, a milk chocolate yoghurt with citrus cloud and citrus crumble. The citrus cloud was a little weak and while the whole dessert wasn't bad, it certainly wasn't memorable (hence the having to check the menu to remember what I had eaten). I chose the raspberry granite for my 4th course. The dessert came in a bowl glass and the "granite" was like macerated rasberry which had taken on this great ruby colour. Below it was a generous whirl of milk chocolate foam, hazelnut praline and nougatine. The thing is, by then my taste buds were so saturated and sticky that the foam didn't taste like foam but cream. The dessert was good but it was also heavy, rich and generally, overwhelming. I think the key word was really "overkill" by this point, as we were stuffed from the main and the first dessert but to be fair, what I tasted of the raspberry granite Was good. For my dessert grande, I had the pain perdu. This was satisfying, although a little plain, the french toast was comforting and well-made. This is the other dessert grande at the table, I think it was the Grand Marnier Tea Baba, the others had a One, Two, Tea for their 5th course. This came in a chocolate egg which contained chocolate cream and a pretty, pink rasberry espuma. I think where the chef and the restaurant both deserve credit, is that the cooking is inventive and artistic. Although you could probably figure it out, it's still fun to gawk over the arrival of each dish and wonder to yourself exactly how he had structured, for example, the chocolate egg. It somehow makes you feel like you're paying for the uniqueness of it all and his effort at assembling what you're about to eat. The last course was the petit fours which were a rich tiny slice of chocolate, a baby sized truffle macaron which was excellent and a citrus yuzu gelatine jelly sweet. By then we were too sugar-exhausted to think about any judgement on the standard nor substantial-ness of petit fours but thinking back, they were good. The meal was an experience alright but it was just...too much. Somehow I felt the subtlety had been lost in the myriad of tastes, both sweet and savoury and despite all that sugar, I didn't walk out of the place feeling happy. I seem to have gone into Japanese overload of late but well, it is my favourite thing to eat when I'm not eating at home. This is a post about a little place in China Square, where my friends gathered to welcome home one of our college friends. This happens to be one of his favourite places and having eaten there twice now, I can definitely say I understand why he feels it has a great blend of quality and value. I'm really particular about Japanese restaurants and here's why. Singapore is just so blessed to have an involved Japanese community and so much choice in Japanese food that I just don't see why we should or have to be eating the crappy stuff. Japanese restaurants are ubiquitous here, which to me, means Singaporeans have no excuse for not being particular about the freshness, value and service in Japanese places and should be all the more on the look-out for places that emerge from this list as particularly special in all those regards. Botan is in the courtyard area of China Square, just opposite the banker-dominated Kazbar and Oosters. The entrance isn't that large so you could conceivably walk right by it, although the Raffles Place crowd has definitely caught on, there is a healthy line out the door every lunch time. The decor isn't spectacular, the floor is tiled and the tables heavy and wooden, the crockery generic. This isn't a place you come to for mood, or lighting but the food more than makes up for the dining experience. The last time I came here, I had the Kaisen Don, which is an unusual combination of rice, salmon sashimi and ikura (salmon roe), with some greens and a liquid yam sauce with a bit of garlic and soya sauce mixed in. This is still my favourite thing to have here and for a $17 set (with miso soup and dessert) it's not a bad deal. This time though, we had my friend to order for us and more people, so we shared a whole bunch of rolls. This is the inside-out tempura roll, california roll, the soft-shell crab roll and the tuna roll. All of them were really good- fat, full and juicy on the inside, yet still dry on the outside. We also had yakitori, which was surprisingly cheap, about $4 a plate. This isn't my favourite Japanese food, so I don't know if the flavour is worth it though I would assume it was at least not bad. We had matcha ice creams with azuki beans to round off the meal. All in all, very satisfying, convenient and reasonable a meal. This will definitely be one of my staples in town to come back to!